Six people arrested during brawl at Vero Social Club in Vero Beach. 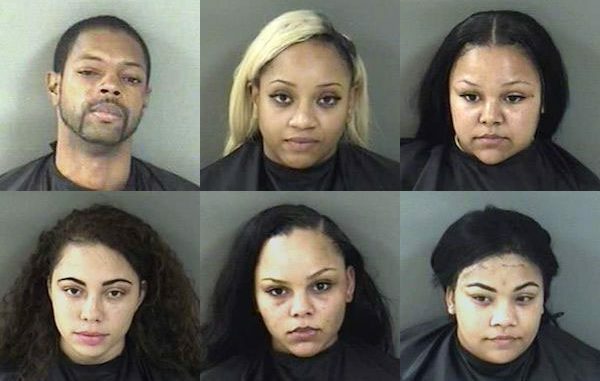 VERO BEACH – Police say six people were arrested at a club in Vero Beach after deputies responded to complaints of loud music, according to the Indian River County Sheriff’s Office. The incident took place Sunday night at the Vero Social Club, located in the 7500 block of U.S. Highway 1 in Vero Beach. Laurel Brown, 32, was arrested and charged with a misdemeanor violation of noise ordinance after being warned previously about the music levels inside of the club. As the night ended, various fights erupted in the parking lot causing deputies to intervene. Nekoosa McPherson, 24, Latrina Dixon, 22, and Brittany Tierney, 23, were arrested for affray, as they were all three punching and kicking during the fights. Latrice Dixon, 23, was also involved in a fight but proceeded to spit in the face of Deputy Thimmer as he took her into custody. Preshae Tierney, 18, started one of the physical altercations amongst the women, by trying to punch another woman in the face but struck Sergeant Flores causing his eyeglasses to fall off of his face and break on the ground. “Lieutenant Campbell assisted in separating the women and was also struck in the face causing damage to his eyeglasses,” Maj. Eric Flowers told Sebastian Daily. Both Preshae Tierney and Latrice Dixon were arrested and charged with affray, battery on a law enforcement officer and resisting arrest without violence. “Law enforcement continues to be a dangerous career. As most citizens in our community were home sleeping, our deputies were breaking up fights at the Vero Social Club. We are thankful for our deputies who keep the county safe both day and night,” Indian River County Sheriff Deryl Loar said.